This is a story of a wren nesting indoors in a hanging plant and how the author managed to move the nest outside. In the spring and fall, when the weather is nice and the insects are not bad, we will let our patio door stay open. 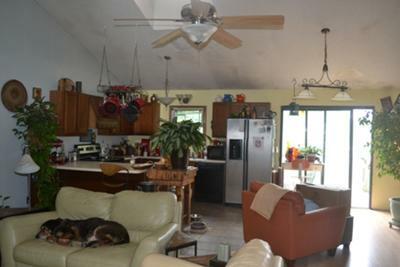 We have three dogs and it gives them the freedom to venture in and out of the house whenever they please. 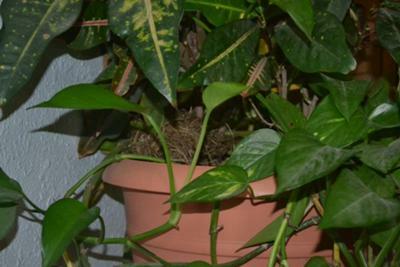 I was in the kitchen one evening and a wren flew past and went right into one of our house plants. We normally take our plants outside for the summer but had not done that yet. After a closer look inside the plant we found a nest with eggs. We love the birds around our home. We have bird houses and feed them throughout the year, but having a nest actually inside the house is something quite new. As mentioned before, we have three dogs. So before these little ones begin to leave the nest, we will have to move it. There is a deck right outside the door where the adults have been coming in. Following the advice given to us through this wonderful website, we will begin slowly moving the plant closer to the door and eventually to the outside. We will let it stay on the deck until it is empty. We can block off 1/2 of the deck to keep the dogs away. I have taken three pictures. One showing our interior - the patio door on the right and way over on the left of the shot is the plant where the nest is, on a stand. 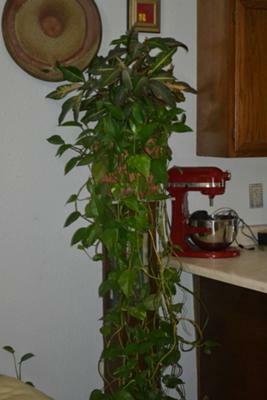 One showing just the plant, on it's stand. One which you can see the nest. Slow and steady, keeping everything as straight of line as it currently is. If there is no problem with the first move, you can move it further the next, and so on. Don't move until the the young can make noise. This will help the adults locate them. Keep us all posted by commenting under your story. Good Luck. I have a Wren nesting in my house.. There were five eggs in the nest yesterday now there is only two..what could of happened to them...I have no cats or kids.. So happy it worked out for you Linda. This was a tricky one. And I might add, a first for me. You may have to send any additional photos to me since you can only add photos when you first submit your story. So cool - thanks for sharing. So we have been moving the plant, approx five foot or so at a time. Then on Thursday night, the plant was about 6 or 7 feet away from the door. I was at 'book club' and had just told all of my book club friends about the nest when my phone rang. It was Geff calling to tell me that one of the chicks had jumped the nest (planter). He scooped it up - it actually jumped onto his finger and sat there - and put it back into the nest. It jumped again a few minutes later. At that point, keeping the planter in the house was not an option. He moved it out to he deck. The next morn we saw the adults still caring for the nest. By late that afternoon, all of the babes were gone. Mission has been accomplished! I have pictures and will post if i can figure out how.